If you drop an aluminum spoon in a sink full of water, the spoon will sink to the bottom. That's because aluminum, in its conventional form, is denser than water says Utah State University chemist Alexander Boldyrev. But if you restructure the common household metal at the molecular level, as Boldyrev and colleagues did using computational modeling, you could produce an ultra-light crystalline form of aluminum that's lighter than water. Boldyrev, along with scientists Iliya Getmanskii, Vitaliy Koval, Rusian Minyaev and Vladimir Minkin of Southern Federal University in Rostov-on Don, Russia, published findings in the Sept. 18, 2017, online edition of The Journal of Physical Chemistry C.
The team's research is supported by the National Science Foundation and the Russian Ministry of Science and Education. "My colleagues' approach to this challenge was very innovative," says Boldyrev, professor in USU's Department of Chemistry and Biochemistry. "They started with a known crystal lattice, in this case, a diamond, and substituted every carbon atom with an aluminum tetrahedron." 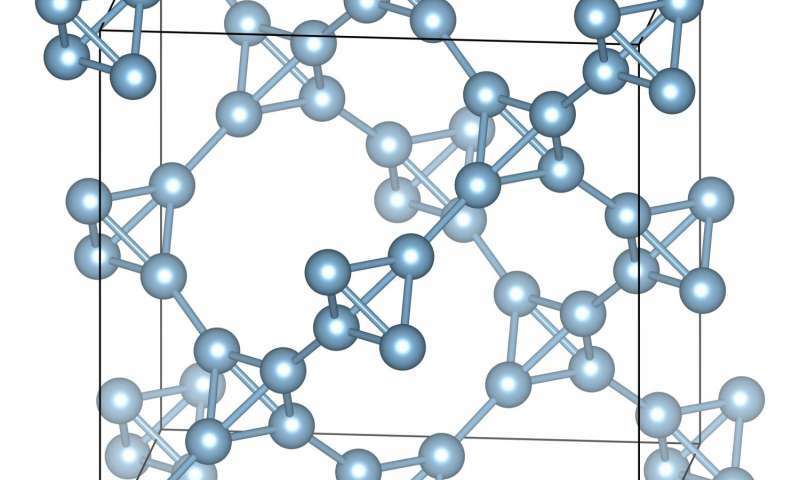 The team's calculations confirmed such a structure is a new, metastable, lightweight form of crystal aluminum. And to their amazement, it has a density of only 0.61 gram per cubic centimeter, in contrast to convention aluminum's density of 2.7 grams per cubic centimeter. "That means the new crystallized form will float on water, which has a density of one gram per cubic centimeter," Boldyrev says. Such a property opens a whole new realm of possible applications for the non-magnetic, corrosive-resistant, abundant, relatively inexpensive and easy-to-produce metal. "Spaceflight, medicine, wiring and more lightweight, more fuel-efficient automotive parts are some applications that come to mind," Boldyrev says. "Of course, it's very early to speculate about how this material could be used. There are many unknowns. For one thing, we don't know anything about its strength." Still, he says, the breakthrough discovery marks a novel way of approaching material design. "An amazing aspect of this research is the approach: using a known structure to design a new material," Boldyrev says. "This approach paves the way for future discoveries." Wonder how long it will be before we catch up to Star Trek and get transparent aluminium - something tells me this isn't far fetched anymore. Nothing about how you might actually produce the stuff ('easy to produce')? But is it as strong and as tough as standard aluminium. No use if the stuff will simply fragment apart or fold at the slightest disturbance. Russians are too often liars when it comes to research, making claims they can't substantiate. Also, even if they did have something viable, you can't just will different orders of materials at your leisure. Nothing will come of this. "sapphire glass from GT Advanced Technologies is generating a lot of interest. It's much harder to scratch than Corning's market leading Gorilla Glass (which is probably on your phone right now)"
"Sapphire (Al2O3) Synthetic Sapphire is a single crystal form of corundum, Al2O3"
-as usual no research, lots of babble. We should soon be using materials like diamond and sapphire for industry and construction applications. Great. Let's add it to the list of fantastic theoretical material we have no idea how to actually make. It looks like its tensile strength would be alright but its shear strength looks pretty weak. Exactly. Besides it might be as brittle as chalk for all we know. Real life imitates Star Trek again. Is this new aluminum going to be transparent? In Star Trek IV "The Voyage Home" Scotty invented transparent aluminum said to be stronger and much lighter than plexiglass. It was used as a whale tank. A one-inch thick sheet of Star Trek's transparent aluminum, measuring 60 feet × 10 feet, was capable of withstanding the pressure of 18,000 cubic feet of water, which could be used in place of a six-inch thick sheet of plexiglass. (Star Trek predicted phasers and cell phones. Please someone invent a warp core). It probably crumbles like unfired clay.